Click bait headlines, such as the one above, may not have been “liked” instantaneously around the 13 original American colonies, but fake news and misinformation was still a factor in the news cycle of 1776. 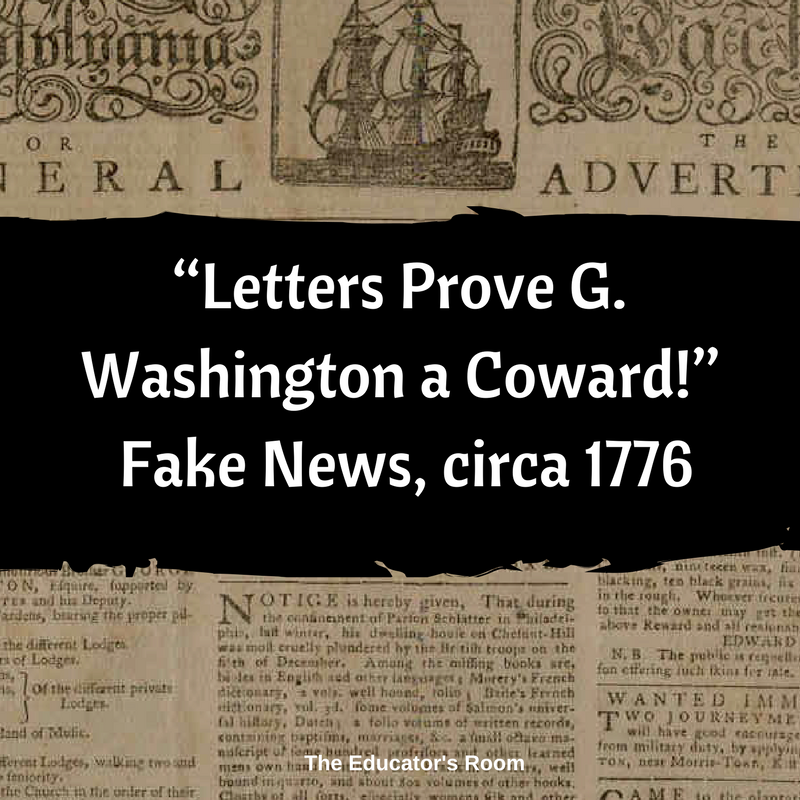 A close look at American history reveals that fake news has been around since the country’s inception, and even the honorable George Washington had to confront the repercussions of intentional misinformation. The discovery and then release of this misinformation in these documents would have certainly delighted the hearts of British loyalists. In fact, the timing of this faked correspondence as news in November of 1776, soon after the disastrous military decisions Washington made in New York, was meant to encourage Tories in America and in Britain. 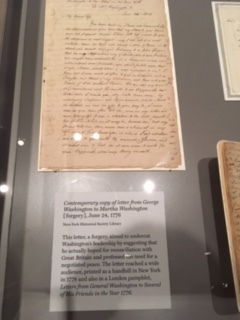 A forgery: “Contemporary Letter from George Washington to Martha Washington, June 24, 1776” on exhibit at the NY Historical Society. These forgeries, reported to be in Washington’s hand, were supposedly found in a large trunk, a portmanteau, that had been left behind while during the General’s hasty retreat to Fort Lee, New Jersey. The crafted propaganda pieces were intended to question the integrity of that upstart who was leading the American revolution. The letters may not have had the desired effect at their release, but they caused considerable problems when they resurfaced again twenty years later in 1795. In that summer, Washington was in his second term as president when the Jay Treaty, which sought to normalize the new government’s relationship with Britain, turned into a political hot topic. Federalists Alexander Hamilton and the architect of the treaty, John Jay, supported the treaty. They were fiercely opposed by leading Republicans Thomas Jefferson and James Madison who believed the treaty was betrayal of America’s relationship with France, who was at war with Great Britain. In his retelling, Lengelmarch suggests that Washington initially underestimated the power of such misinformation. Even though there were Federalists who decried the letters’ authenticity, the letters were repeatedly reproduced in Republican sympathizing newspapers. Washington finally broke his silence and repudiated the letters on March 3, 1797, his last day in office. In 1799, Congress posthumously decreed that Washington was “first in war, first in peace, and first in the hearts of his countrymen.” We also know that he was the first American president who had to confront fake news and misinformation. Other American presidents have had to deal with fake news. During his Presidential reelection campaign in 1864, President Abraham Lincoln was challenged by the news circulated by The New York World that claimed Lincoln and his Republicans advocated intermarriage between the white working class and blacks. Later that year, the Journal of Commerce ran a story that Lincoln was going to conscript a number of men. The origin of the fake news was a Brooklyn speculator who was trying to move the money markets, and a frustrated Lincoln had to shut down the Journal of Commerce for a couple of days. The difference today is that the fake news and misinformation that Washington and Lincoln had to confront in their lifetimes was somewhat limited to the platforms of print media. They did not have to compete against a 24 hour news cycle fed by an increasing number of platforms that disseminate a crush of raw or unvetted information daily. What is the same, however, is the challenge any American president faces in countering the efforts of a single individual, who with a handwritten letter, a text, or a tweet, can create fake news. Whether it be the pen or the keyboard, such misinformation can undermine the processes of democracy. We should know that fake news and misinformation in American history is not a recent phenomenon. Therefore, we need to train ourselves -and our students- to be more skeptical. We need to consider who may benefit from a salacious headline or tempting tagline. When the clickbait seems too promising to resist, we must be ready to stop and ask who is promoting that information… and why? Without healthy skepticism, we may be just like those British sympathizers who were duped by tools of propaganda. Washington reportedly never told a lie, but as for the charge of being a coward? History has the evidence to prove that charge was most definitely fake news.